Got a Question? Ask Callie! Callie the Cat knows all and sees all. Have a question? Just ask Callie! Q: What's the big deal with having an outdoor cat? Callie: Don't get me started! No cat should be an outdoor cat, unless it's a lion or something. 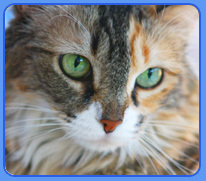 The Humane Society estimates that the life span of a "free-roaming" cat is less than three years, compared to a 12-15 lifespan for the average indoor cat. The sad fact is that more than one million (yeah, that's million) cats are killed each year by traffic, dogs and exposure to disease. Why on Earth would you want to expose your beloved cat to the elements, to possible harm from cars or people, or any of the other hazards an animal might face outside the warmth and safety of your home? Remember, all the laps are indoors, so that's where a cat should be, too. Q: What's so wrong about chaining a dog outside? Callie: Hello! Please try to pay attention. Outside, bad. Inside, good. Dogs weren't meant to be chained. They feel confined, and being chained is often physically painful. Chained dogs are far more likely to run off at the first opportunity, because coming back means they have to face being chained up again! Chaining a pet can lead to bad behavior, too. Don't blame your dog for misbehaving if you've been lazy and mean and used a chain. There are easy ways to avoid having to chain your dog. Not that I'm a huge fan of dogs, of course, but every animal deserves to be treated with care and compassion, and that's that. 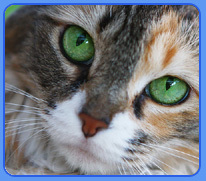 Q: What's so important about spaying and neutering? Callie: Let's face it, we all like to get some action once in awhile. The problem is, animals like cats can breed way too quickly, and that can lead to overpopulation, bigtime. A pair of breeding cats can have several litters per year, and their descendants can theoretically produce about 250,000 (again, not a typo) offspring over a five-year period. Phew. I'm feeling tired just thinking about it. Overpopulation leads to the needless deaths of 4-5 million pet-quality animals each year. Spay and neuter! Q: What is a feral cat? Callie: No, a feral cat isn't just a cat that's having a bad day. Feral cats are the wild offspring of domestic cats. They survive as best they can, but their lives are pretty miserable. Doing the spay/neuter thing helps with the feral cat population, but it's still an overwhelming, often sad problem. In Las Vegas, where I live, there's a feral cat clinic that's fighting the good fight for feral cats. They rock. Take it from me, feral cats have issues. I dated a feral cat once, and he couldn't keep his paws off of me. Q: What's so wrong with declawing a cat? Callie: Oh. No. You. Didn't. Let's start with this little goodie: Declawing involves 10 separate and painful amputations. Not swayed? Take a look at the charming graphic below. See the dotted line? That's the "line of amputation." That's not just a nail. That's toe. This procedure causes animals agonizing pain. A good word for it is "mutilation." Find out more. And here's a good rule of thumb: Don't do anything to your cat (or to any animal) that you wouldn't want done to you! Q: How many centipedes are in the world? Callie: How would I know? I'm a cat. Q: I found a cute puppy in a pet store. Should I get it? Callie: Granted, those pet store puppies and kitties are cute (aren't we all? ), but buying a pet store pet actually encourages and finances "puppy mills" and other breeding farms that treat animals like widgets, and that's really not a lot of fun. There are tons of adoptable animals at your local shelter. The puppy mill industry is driven by greed, and terrible conditions are common. Without the demand, puppy mills would go away. Don't contribute to the problem, help solve it. Like you've got anything better to do. Q: Hey, if I witness animal abuse, what can I do? Callie: This site might be a good start. Bottom line: Take action. Animals, for the most part, don't have a voice of their own. Except for parrots, but they tend to just repeat the same phrases over and over like they've had some kind of head injury. The point is, animals being harmed need you to help. Animals don't have lawyers (although these folks help a lot). They don't have mace to protect themselves. You're it. Help whenever you can. It's that simple. Q: What's smarter, a dog or a cat? Callie: Ever read a Q&A with a dog? Bor. Ing. Check back again soon for more answers from Callie the Cat. Got a question? Send Callie an e-mail now.